Located in south-central Kentucky, Wayne County lies in both the Mississippian plateau and the Eastern Kentucky coal fields. Beautiful Lake Cumberland forms much of the northern border of Wayne County, while Tennessee forms the southern border. Wayne County has a large labor supply and an expanding manufacturing economy. If you have any news you would like published on the site or would like to advertise with us, please contact us via the details below. 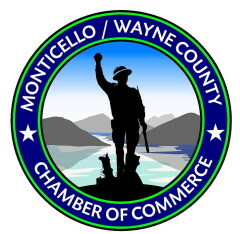 On behalf of the Monticello/Wayne County Chamber of Commerce Members, and the Board of Directors, welcome to our web site. We hope you find what you need here, but if not, you may call our office at (606) 348-3064 or toll free at 1-866-348-3064. The office hours are 9:00 a.m. to 3:00 p.m. Eastern Time, Monday through Friday. Or better yet, stop by our office located in downtown Monticello, 120 S. Main Street / City Hall. The Chamber was organized in 1967 with the stated mission to promote our area and the business community. Times have changed, but our mission remains the same. I urge each of you to come and experience the natural resources we have available. A week spent on Lake Cumberland, in a luxury houseboat, is truly a week spent in paradise. Wayne County is, after all, the Houseboat Manufacturing Capital of the World! Or perhaps you would prefer a week spent camping with the family, in one of our many campgrounds, or hiking the miles of trails that cross our majestic mountains! Whatever you choose to do, you will soon see why Wayne County is regarded as the most beautiful area in all of Kentucky! It’s here, waiting for you and your family to enjoy and explore. Let the citizens of Wayne County and Monticello show you the hospitality that we are famous for. Once again, thanks for stopping by. We look forward to having you and your family in Wayne County real soon!